The revised Muirburn Code has been launched. Volunteers sought for further development. Suggestions for promotion of the revised Code. The launch of the Code on Friday 22nd September marked an important milestone in the development of a suite of guidance for practitioners. The Code establishes the constraints for burning and cutting moorland vegetation. It sets out good practice, but it does not provide a lot of detail about techniques. This was never the intention for the Code. The Supplementary Information that has been provided as part of the Code provides some additional information but it is intended to enhance and expand this. The Code is available in webform on the dedicated website - www.muirburncode.org.uk. A PDF version of the Code is available from the SNH website, and the Supplementary Information is available from the Muirburn Code website. The Scottish Government website will no longer host the Code. Before the review started, the Muirburn Group carried out a critique of the existing Code for the Scottish Government, and the report from this work recommended a structure for a revised Code and a long list of issues to be considered. The review, which has just been completed, addressed some of these topics, but not all of them. A diagram, taken from the Critique Phase report, is available here. The issues in green boxes have been addressed during the review; the issues in orange boxes have yet to be considered. All members of the review steering group, supported by members of the Moorland Forum, were encouraged to promote the Code to their contacts / members / supporters (see below). Up to six volunteers would be sought to consider the development of an Action Plan for the further development of the issues identified during the review, and any other relevant topics. The draft Action Plan will be circulated for comment to everyone with an interest in muirburn. The draft Action Plan will then be revised and the method of delivery considered. Appropriate resources from public, private and/or NGO sources, will be required to achieve significant progress. Obtaining these will be an early task in the process to deliver the Action Plan. Volunteers to help with the development of the Action Plan should contact Anne Stoddart. The Moorland Forum will facilitate the discussions to develop the Action Plan, but it should not be assumed that the Forum will be in a position to manage the process to deliver the Action Plan. During the launch event, concerns were expressed about the scope of the Code and the shortage of practitioner guidance. It is easy to criticise a document, such as the Muirburn Code, that has had to consider a very wide range of views, some of which have been in direct conflict. The Code could not hope to cover every angle of every view expressed, nor to cover every topic that stakeholders would have liked. As shown from the structure diagrams produced in the Critique Phase report, the aspiration for muirburn guidance goes well beyond the revised Code. Accepting that the Code satisfies the requirements for a statement of the regulatory constraints, the aim is now to enhance and expand the Supplementary Information to provide more detailed guidance. As contacts / members and supporters review the revised Code, the aspirations to develop more guidance should be explained to them. Also, to aid the decision about what issues to tackle first, any suggestions for priority issues will be welcome. The Muirburn Code has been updated to ensure that it provides effective and up to date guidance for the people who manage Scotland’s moorlands. The review was commissioned by the Scottish Government, and the work was undertaken by Scotland’s Moorland Forum, an independent body made up of key stakeholders from across all areas of land management. Over the course of several months, Moorland Forum representatives gathered opinion on muirburn from a wide range of agencies, groups and individuals, and the process included a series of ‘talk and walk’ workshops which were held across Scotland, from Skye to the Borders. A final workshop was then held in Central Scotland to discuss and incorporate all the feedback and refine a draft version of the Code. The review adopted an inclusive approach, and this process engaged with different ideas on what should and could be included in the Code. Careful drafting aimed to ensure that the end product is representative of the many interests involved in and affected by muirburn. Commenting on the publication of the updated code at a launch event at Blair Castle on the 22nd September, Roseanna Cunningham MSP, Cabinet Secretary for Environment Climate Cange and Land Reform said: “I am pleased to publish a revised muirburn code of conduct, which clearly sets out best practice and guidance for burning and cutting heather and other vegetation as a land management tool”. “The revised code aims to minimise the practice's negative impacts on wildlife, landscapes and ecosystem services, while also enhancing the wider socio-economic and environmental benefits well-managed muirburn practices can have”. “My thanks goes to everyone involved in the review, which will ensure that the code remains up to date and fit for purpose. I would like to encourage practitioners to continue working together to enhance the supplementary information that has been developed in support of the Code”. Simon Thorp, Director of Scotland’s Moorland Forum also added that “the review process has engaged effectively with a large range of people and the revised version of the Code has been improved as a result of their input”. “It has taken time to develop the final version, but the result is a Code that is up to date, and makes greater reference to cutting, both as an independent operation and in support of muirburn, the integration of muirburn with grazing management, and the requirement to consider the sensitivity of peatland”. A PDF version of the Code will be available to download from the Scottish Natural Heritage website, but a novel feature of this version of the Code will be the dedicated website www.muirburncode.org.uk established to present the Code, and the associated Supplementary Information, in web format with links within the Code and to external sources of information. The website has been designed with the practitioner in mind, and it is intended that the required information should be viewed or printed easily. Supplementary Information provides additional background information and guidance for practitioners. All those with an interest in muirburn are asked to promote the Code around their networks. Some presentation material to support this will be made available on request. The revised version of the Code will be available soon after the launch by the Cabinet Secretary on Friday, this week. An advance copy of a text only version is being sent to everyone who has contributed to the review, but this is being done with a 'health warning'. A wide range of views have been expressed about burning and cutting during the review. All the comments have been carefully considered and every effort has been made to accommodate all views. However, due to the conflicting nature of some of the views, it has not been possible to incorporate every single one. A middle ground solution has been adopted wherever possible, and therefore it is likely that no-one will be completely satisfied with every part of the revised Code. After the launch event on Friday, a discussion will take place about what needs to be done next. 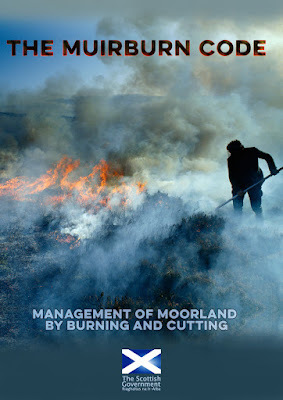 It is important to recognise that the Code mainly sets out the constraints on burning and cutting, but it is clear from the critique phase of the review, reinforced during more recent discussions, that there is a need for additional practical guidance about muirburn. A start has been made with the Supplementary Information that has been prepared as part of the review; other guidance will aim to provide advice to practitioners to maximise the benefits of burning and cutting, while minimising the risks to people and property from this activity. There are also opportunities to consider issues such as: training, certification, research and knowledge exchange. Therefore, we should not see the publication of the Code as the end of the process; I suggest it is only the start. Practitioners will be encouraged to support the development and expansion of the Supplementary Information to provide information that is of relevance to them. It may be appropriate to rework all the additional guidance into a Prescribed Burning Guide that brings together all relevant information in one place. Roseanna Cunningham MSP, Cabinet Secretary for Environment, Climate Change and Land Reform will launch the revised Code and members of the Review Steering Group have been invited to attend the launch event on Friday, 22nd September at Blair Castle. I will circulate an advanced text version of the Code to everyone who has contributed to the Review, early this coming week. The Code will not be printed for circulation and a PDF version of the Code will be available from the SNH website, after the launch on Friday, 22nd September. The dedicated website www.muirburncode.org.uk will provide access to a web-based version of the Code, which will contain hyperlinks to other information. This website will also host the Supplementary Information, which will be available to view or download as a single, combined PDF document, and in due course in separate documents for each topic. Revising the Code is only part of the story. We now need to make people aware of what it contains. Please could you circulate details of the Code round your networks and through social media, member newsletters, websites, other blogs etc.? I highlighted some ideas for further work in the last blog post. These issues will be discussed with members of the Muirburn Group and I will circulate details of what is decided through this blog. All ideas and suggestions will be welcome. Promotion of the revised version of the Code and the Supplementary Information will be discussed with the Muirburn Group after the launch, and any useful details will be circulated through this blog. There has been little to report about the development of the revised Muirburn Code, since the end of the workshops in March. Draft versions of the Code and the associated Supplementary Information, which incorporated the feedback from the workshops, was submitted to the Scottish Government in April, and since then, plenty of work has been taking place to refine this draft. This blog post provides a summary of the progress and outlines the next steps. Those who attended the four workshops held in February and March. For obvious reasons, it has not been possible to include every bit of the feedback I have received, but I believe this final draft to be representative of the range of opinion that has been expressed. The final draft has been circulated to the Review Steering Group, and key contributors to the review process. The current draft is text only. The final version will include additional illustrations and photographs. At this stage, detailed comments are no longer required, but suggestions about structure and any issues that may have been missed or not covered correctly will be considered. The original intention was for the Code to be web based, and the online content would be supported by the ability to print a full version of the Code or extracts from it, locally. This approach poses questions around where the Code and the Supplementary Information is hosted, who controls access to it, and the protocol for introducing changes. The Scottish Government will make a decision about final format of the Code. Contributions of good quality photographs showing burning or cutting activity will be welcomed, with a view to adding some illustration to the final version of the Code. The source or the photographer will be credited. Roseanna Cunningham MSP, Cabinet Secretary for Environment, Climate Change and Land Reform, has agreed to launch the revised Code on Friday, 22nd September. A proposal has been made to the Scottish Government for this to take place in Perthshire. In the report from the initial critique phase of the review, the Muirburn Group recommended a range of issues that should be addressed as part of developing an improved approach to muirburn, which included a closer integration with wildfire issues. Training, certification and research are three important topics that were identified in the Critique Phase Report that have not yet been considered. The current phase of the review is delivering a revised Muirburn Code, but there remains much work that could be done. The launch of the Code will be an important milestone, but it will have little impact if the provisions of the revised Code are not acted upon. 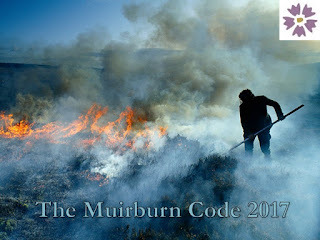 All those with an interest in muirburn are asked to promote the Code around their networks. Some presentational material, which may help people to promote the revised Code at their events will be produced and made available on request. The final version of the Code will be made available as soon as possible. An announcement will be made on this blog, and details will be circulated.